It's that time of year again. 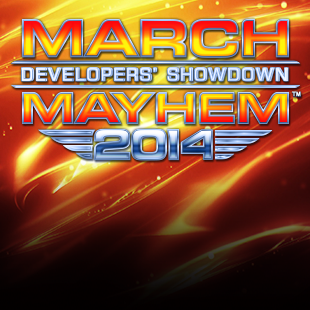 It's time for March Mayhem! This year we let you, the readers, choose who was going to make it to the big show. Now it's time for you to pick the winners. We have some very interesting match-ups this year and, with any luck, we'll see some of the plucky independent developers blow some AAA companies out of the water. We have some new faces on here, Galactic Cafe is new to the scene after developing the smash hit Stanley Parable, and Lucas Pope who came up with the sleeper hit, and narrow runner up of Escapist's Reader's Choice Game of 2013 with Papers, Please. This year we're ready to make history and let one lucky developer join the illustrious ranks crowned winners. The previous champions have been Valve (twice), Turbine (twice), and Mojang. Let's see who else we can add to that list of winners. This year we have 16 developers to whittle down to find out the top dog developer of the pack. There are eight independent and eight AAA developers that have made it, by community choice, into the sweet sixteen, and now's the time for them to fight it out, Thunderdome style, all for your amusement. The stage is set for an epic throwdown between some of the most influential developers in the history of gaming, so don't forget to grab a seat and some popcorn. Bracket submission is now open. Make your predictions of who is going to win each round and, if you win, the top ten bracket owners will get a sweet limited edition badge and a yearlong subscription to The Escapist Publishers Club. Don't be shy, we all know that everyone wants to be the first kid on their block with a winning March Mayhem bracket. So make a bee line to the submission and show the world you know how to pick 'em.